MATERIAL OF P.G.CLAMP = ALUMINUM ALLOY GRADE 4600 CONFORMING IS 617-1994 (LM-6). MATERIAL OF NUT, BOLT, PLAIN WASHER – MILD STEEL HOT DIP GALVANISED. SPRING WASHER SPRING STEEL ELECTRO GALVANISED. 1) PLEASE ADD SUFFIX SS FOR CLAMPS WITH STAINLESS STEEL NUT BOLTS e.g. CATALOG NO. OF TERMINAL FOR STUD DIA. 43.00/46.63 TO 43.00/46.63 WITH STAINLESS STEEL NUT BOLTS IS A2CPG-137_SS. 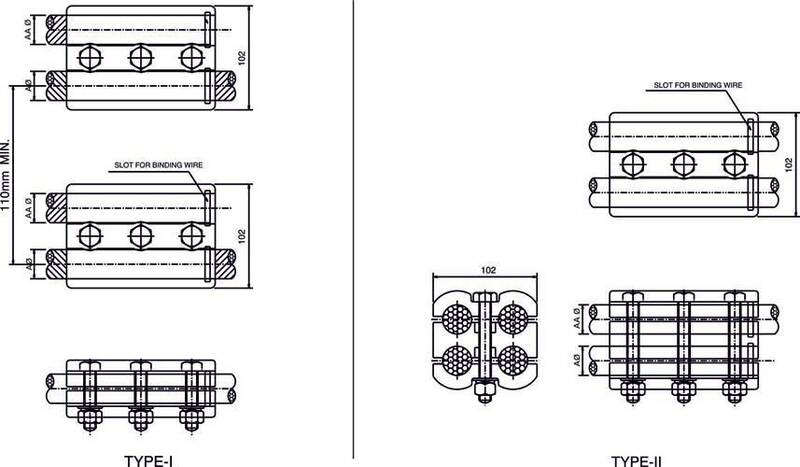 2) FOR TYPE – II PLEASE ADD SUFFIX ITEM CODE “_II” FOR EXAMPLE FOR TYPE – II PARALLEL GROOVE FOR TWO CONDUCTORS TO SUIT CONDUCTOR DIA 30.00 – 32.00mm. TO 30.00 – 32.00mm CATALOGUE NO. WILL BE OR IS A2CPG-69_II.